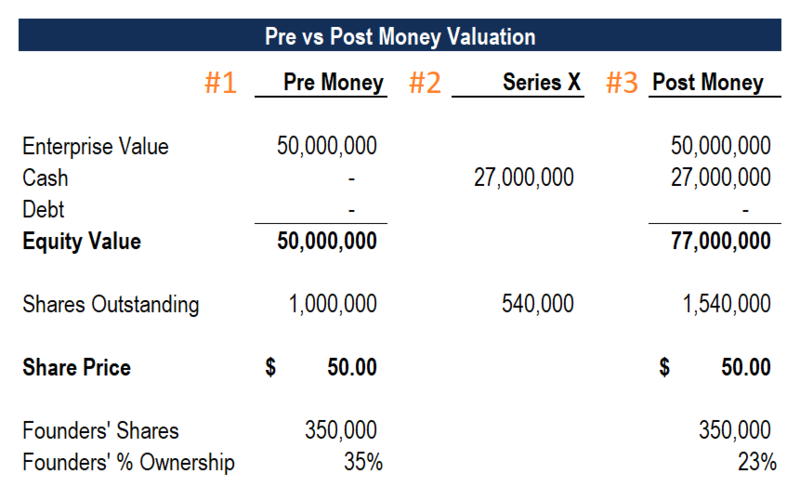 What is Pre Money Valuation? Pre money valuation is the equity value of a company before it receives the cash from a round of financing it is undertaking. Since adding cash to a company’s balance sheet increases its equity valueEquity ValueEquity value, commonly referred to as the market value of equity or market capitalization, can be defined as the total value of the company that is attributable to shareholders. To calculate equity value follow the examples and step-by-step instruction in this straightforward guide from CFI., the post money valuation will be higher because it has received additional cash. It’s important to note that pre money valuation refers to the total equity value of the business, and not the share price. While the equity value is impacted by receiving additional cash, the share price will be unaffected. The example below will illustrate why that’s the case. Below is a company that has a pre money equity value of $50 million. The company has one million shares outstanding, so its share price is $50.00. The company is seeking to raise $27 million of equity at its pre money valuation of $50 million, which means it will have to issue 540,000 additional shares. The company adds $27 million to its pre money valuation of $50 million for a post money valuation of $77 million. The company now has 1.54 million shares outstanding, so its share price is still $50.00. A company’s enterprise value (EV) is the value of the entire business without considering its capital structureCapital StructureCapital Structure refers to the amount of debt and/or equity employed by a firm to fund its operations and finance its assets. The structure is typically expressed as a debt-to-equity or debt-to-capital ratio. Debt and equity capital are used to fund a business’ operations, capital expenditures, acquisitions,. It’s important to point out that a company’s enterprise value is unaffected by a round of funding. While a company’s equity value increases by the amount of cash, its EV remains constant. It’s important to point out that the existing shareholders (before the transaction) will have the ownership percentage diluted by issuing new shares. In the example we used above, the founders had 350,000 shares before the Series X, which represented 35% of the total shareholding. Post-transaction, they will still have 350,000 shares, but that will only represent 23% of the total. The value of their shareholding remains unchanged (350,000 x $50 = $17.5 million). 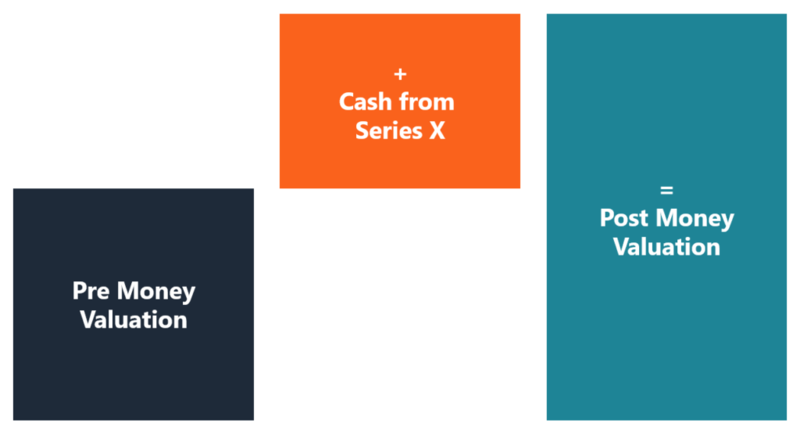 For early stage companies, the value of the cash that will be received from a round of financing can have a meaningful impact on the equity value of the business. It is why the phrase is so commonly used because a company could be looking at a dramatic change in its value. When a company is undergoing a round of financing (i.e., Series X), it will have to negotiate with investors about the value of the company. It can be both an intense and subjective negotiation. To learn more about each of the above techniques, see CFI’s guide to valuation methodsValuation MethodsWhen valuing a company as a going concern there are three main valuation methods used: DCF analysis, comparable companies, and precedent transactions. These methods of valuation are used in investment banking, equity research, private equity, corporate development, mergers & acquisitions, leveraged buyouts and finance. There is no single formula to calculate a company’s pre money valuation because it’s entirely subjective. What the business is worth may be a function of any of the three valuation methods outlined above. 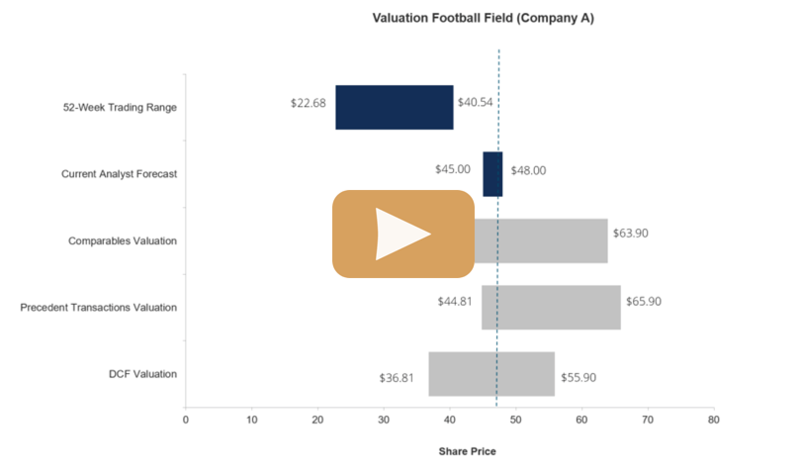 Since there is additional value in all of the above attributes, the VC firm’s preferred shares will be worth more than the common shares. It means they essentially get to buy preferred shares (which are more valuable) at a common share price (which are less valuable), making their investment returns more attractive.